The City of Brotherly Love Softball League appreciates you stopping by and hopes you will join us in Philly this year for a weekend of non-stop excitement. The Liberty Bell Classic Tournament is open to Women's and Open C, & D. We have arranged special weekend rates at Cambria Hotel, Doubletree by Hilton, Marriott Downtown, Sonesta and Marriott Courtyard not far from the Heart of The Gayborhood and the nightlife that Philadelphia has to offer. Players interested in registering as a pick up player can register by going to the division they are interested in playing in and click on the "Register" button and then choose the "Pick-Up Player" button. 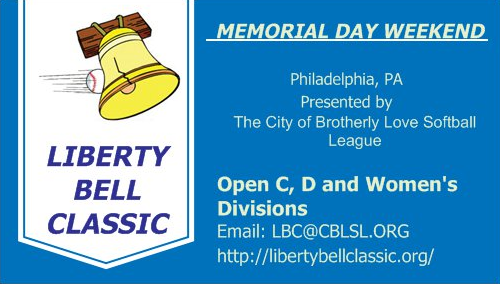 On behalf of The City of Brotherly Love (& Sisterly Affection) Softball League and Liberty Bell Classic Tournament Staff...Thank you for choosing Philadelphia while planning your softball & vacation destinations. The amazing early bird rate ends May 1st!!! Don't hesitate and miss out. REGISTRATION ENDS MAY 17th SO DON'T HESITATE AND MISS THE FUN! !